DST’s Southern Ontario offices attended the Association of Municipalities of Ontario (AMO) Trade Show and Conference in Niagara Fall on August 16th and 17th, 2015. The event was reported to have seen close to 1600 delegates throughout the convention hall, which allowed DST to connect with several valuable clients. 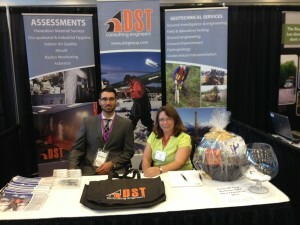 DST also contributed a raffle prize consisting of a variety of delicious chocolates, as well as handed out reusable DST tote bags to delegates.